The Z1 Dashboard software allows you to easily customize the display to suit your style. This customization is done using the Settings Dialog, accessible by clicking the Settings Icon while not connected to a sim, or by selecting 'Settings' from the menu when not in the car. Note that each instance of the Z1 Dashboard software can have different settings. Changing settings for a particular instance only effects that instance. The settings dialog contains several tabs with specific settings under each one. This page describes the Speech tab. The Z1 Dashboard provides a wealth of information to you when in the car. This information is displayed in various formats on the different dashboards. However sometimes looking away form the track for the split-second it takes to view that information can be difficult. So the Z1 Dashboard can speak various items of information to you. This information can be spoken at specific times, or upon a press of a button. This checkbox must be ticked in order to have any of the speech options work. If you do not want any items spoken to you then you should untick this checkbox. This is the speed at which the voice will speak. Moving to the right is faster. This is the pitch of the voice. Moving to the right is higher. This is the test phrased used. Click this button to test your volume, speed and pitch settings. The test phrase will be spoken. The checkboxes below this column indicate what can be spoken. If the checkbox for the item is ticked then that item will automatically be spoken at the appropriate time. Note the scroll bar on the right is used to display all options. The text in the each text box indicates what will be spoken for each item. You can enter what ever you like in the text boxes. Note for the pit stall countdown there are various options in drop downs. 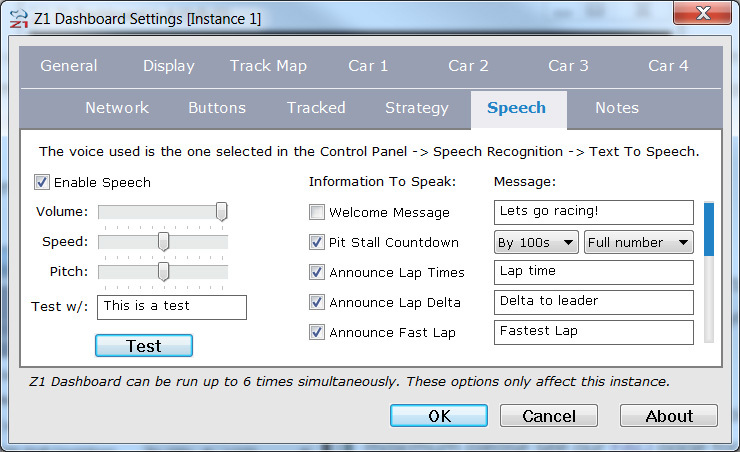 The first drop down indicates how often the distance to your pit stall will be announced. You can choose between 50, 100 and 200. The measurement is associated with the distances selection in the General tab. So if you have selected feet, then the measurements are 50 feet, 100 feet or 200 feet. If you have selected meters then the measurements are 50 meters, 100 meters or 200 meters. If you choose too short a distance then the Z1 may skip some announcements to keep up with the car's current location. The second drop down indicates how the distance is announced. Full Number will read out the entire distance as in '1000,900,800,700...' The 1/100 option will read out just the hundreds unit as in '10,9,8,7...'.